cinnamon, beige and even a bluish- white. The length of this bear's body is usually 5-6 feet from nose to tail and 32-38 inches from paw to the top of its shoulder. They live in most of North America. The female black bear reaches sexual maturity 4-5 years after birth, while the male reaches maturity 5-6 years after birth, they usually have 2 or 3 young. Their mating season is in the summer and they will give birth to their young in January or February. The cubs are blind at birth and weigh 8_ ounces to 11_ ounces. The males do not help raise the cubs, but leave to mate again like most other bear species. The Mother bear can be quite territorial if it involves her cubs. For example, if any animal gets between she and her cubs, she will relentlessly attack it until it is dead. The average black bear lives up 25 years. The black bear's coat is well adapted to the cold weather of winter because of its many layers of shaggy fur. Its claws are also very adapted to its environment, this is because they are just the right length to climb the many trees that surround its forest home. This bear also hibernates to avoid having to find food in the winter. Like most animals the Black Bear looks for food with the highest nutritional value. They will eat virtually anything, but 75% of its diet is made up plants and other vegetation, while the other 25% is made up of, carcasses, honey, small mammals and insects. 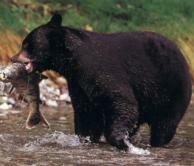 The black bear, like all bears, is a predator, and an omnivore. The black bear helps the environment by killing off the elderly, and weaklings of over populated prey. The black bear is not endangered and is widely distributed throughout most of North America.